Strangler Figs - Ficus ssp. 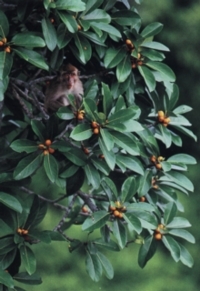 Figs are one of the most important plant species of a rainforest ecosystem. There are close to 1,000 different species of Ficus, which can be found in every major rainforest, tropical continent and islands around the world. Hundreds of animals like pigeons, parrots, hornbills, toucans, monkeys, gibbons, and fruit-eating bats, feed on the sweet fruit of the fig tree. and the number of fruit-eaters determines the number of predators of fruit-eaters. Some of Southeast Asia's Ficus species are Ficus benjamina, F. religiosa F. microcarpa, F. rubiginosa and F. macrophylla and the notorious strangler figs. Strangler figs are tall canopy trees which can grow to 148 feet in height. The manner in which they reach the canopy is a strange story. The forest floor of a rainforest is a difficult place for seedlings to grow. There is little light and a lot of competition for water and nutrients. 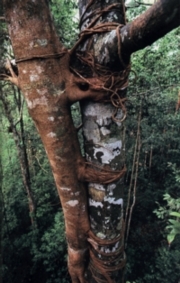 Strangler figs have made an adaptation to avoid these difficulties. Unlike most plants, strangler figs start out their lives as epiphytes in the crook of a tree or on its branches. Tiny, sticky seeds are deposited high in a tree by animal droppings. The seeds are not affected by the animal's digestive tract and soon germinate. The strangler fig has an aggressive growth habit that insures its survival in the rainforest. The seedlings grows slowly at first, getting their nutrients from the sun, rain and leaf litter that has collected on the host. The stranglers send out many thin roots that snake down the trunk of the host tree or dangle as aerial roots from its branches. When the roots reach the ground they dig in and put on a growth spurt, competing with the host tree for water and nutrients. They also send out a network of roots that encircle the host tree and fuse together. As the roots grow thicker they squeeze the trunk of its host and cut off its flow of nutrients. In the canopy the strangler fig puts out lots of leaves that soon grow thicker than the host tree and rob it of sun light. Eventually the host dies from strangulation, insufficient sunlight and root competition, and the strangler fig stands on its own. A hollow center is all that remains of the host. Some figs grow root systems that develop into thin buttresses that can spread out to a distance of about 30 feet. Other figs grow aerial roots from their branches that, when they reach the ground, root themselves and become another trunk on the same tree. Strangler figs have light colored bark and umbrella shaped canopies. Green above and lighter below, the leaves are simple, ovoid and usually between 1.5 - 3 inches long. Waxy leaves protect the strangler fig from drying winds and sunlight that it is exposed to high in the canopy. Perhaps the most amazing part of this extraordinary tree is its flower. What we think of as the fruit is really a hollow, flower-bearing structure called a cyconia. The inside it is lined with hundreds of male and female flowers. The males carry pollen and the females bear seeds. There are two different types of female flowers; one with a short style and one with a long style. Now, if that isn't weird enough, each species of fig has a symbiotic relationship with its own species of tiny pollinator wasp (Agaoninae spp). These wasps are about 2 millimeters long, and enter the cyconia through an opening at the bottom of the fruit. Once inside, they pollinate the long-styled female flowers in the process of laying their eggs in the ovaries of short-style flowers. Without these special wasps carrying pollen from one cyconium to another there would be no seeds. When the eggs hatch, two kinds of wasps emerge; a female and male. When the male hatches it finds a short-style flower and bites a small hole in the ovary wall. He then inseminates the female through the hole and repeats the process with every female it finds. The female will then crawl out of the hole made by the male. As a last act in its short life the male will chew through the cyconium wall to the outside. The females are then able to leave and repeat the process of pollination and egg laying in other figs. Some figs even have two different kinds of trees in the same species; one tree only bear cyconia with short-styled flowers for the wasps to lay eggs in called caprifig. The other tree sets seeds and are delicious so animals will eat them and disperse their seeds. The caprifigs are hard and unappetizing and the wasps can develop without the danger of being eaten. Scientists call this type of symbiotic relationship "species packing". They believe that it allows different species of Ficus to grow side by side without cross pollinating. The diversity of the fig trees stays intact and ensures that each species fruits at its own time. This gives them a greater chance of being eaten by animals and having their seeds dispersed. Strangler figs are also known as banyan trees. The Hindus regard them as sacred because it is said that Buddha once meditated beneath one. Ficus religiosa is the sacred tree of Burma, Ceylon and India. One particular tree of the species of Ficus bengalensis in India is listed in the Guinness Book of World Records (1985) as the world's largest tree, with 1,000 prop roots and covering an area of four acres. Although strangler figs are still abundant, old forests with mature fig trees are being lost every year through logging and fires. New growth trees which replace the Ficus are usually of a single species and fruit at the same time. Animals that relied on the plentiful, year-round fruit of the fig trees either starve or move away. Most will not return to the area. "Stranglers & Banyans", http://waynesword.palomar.edu/ploct99.htm (3/21/2002). "Strangler Fig - Lamington National Park", http://lamington.nrsm.uq.edu.au/docs/Plant/Fig.htm (3/21/2002). "! Strangler Fig Fruit ! Tropical Rainforest, Far North Queensland Australia", http://rainforest-australia.com/canopy7.htm (3/21/2002). "BBC Nature Programs", http://www.bbc.co.uk/nature/plants/worldplants/picpops/tropical _fig.shtml (3/21/2002).